My mom is starting Paleo today and will also begin to incorporate strength and interval training into her routine. She lives in the mountains (45 minutes from the nearest CrossFit gym) with access to rocks/boulders, hills, and nature, but she has no garage and currently no area to throw weights around,. So...what are her options? I sent her a list of "equipment" that I feel will help her with her fitness goals and I thought I would share it with you. We use ours for "Tabata"-style workouts or "Intervals" (workouts that you might work at a particular station or on a specific movement for a specified amount of time). You want something that will alert you at the determined time (for example: You want to complete as many reps as possible in 20 seconds and then rest for 10 seconds). It would also be nice to be able to adjust this timing (one minute on, one minute off), so that you are able to vary your exercises. This iPhone app works well for me; if you are doing 1-minute rounds of a particular workout, you can simply set the "Activity" and "Rest" each. There are so many workouts you can do with kettlebells, so I feel like this is sort of a must. I use a 35lb kettlebell and Scott uses a 53lb; if you've never done KB swings, or are just starting out with your workouts, you will want to start with a lower weight. When I first starting using a KB, I used 10lbs and then moved up to 20lbs shortly after. I like 35lbs for swings, squats, and sumo deadlift high pulls. I like 25-30lbs for press, turkish get-ups, and one-armed swings. Here are some great videos from an incredible coach, Jeff Martone. We have GoFit and Ader brand kettlebells and have been happy with both. GoFit seems to be readily available at many big name stores, but I think it may only go up to 45lbs. Ader can be purchased online or at a local gym equipment store; we buy our kettlebells and everything else, gym-related, from this place. You can find these at most fitness stores. I like the rubberized dumbbells, but they are not necessary. I like 15-25lb dumbbells for myself, but didn't start out at that weight. Feel them out and find a weight that you can move properly, but that will also challenge you. Check your local resale stores, they often have tons (literally) of dumbbells on-hand. The link is to the one we have at home. It was about $3 and is easy to adjust and carry with you...you can take it on walks and incorporate it into your workouts. This will help with your back and will help give you full extension on your sit ups. This is not necessary, but is helpful for building core strength and can be beneficial for anyone lacking such strength. We use ours all the time and LOVE it! This is a great investment, but is just that...an investment. For $900+, it is not a necessity. 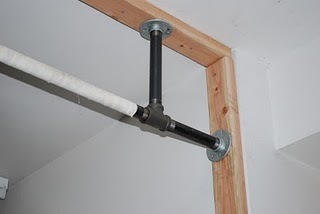 I built ours, but I think this Stud Bar is a really cool option. We were a little skeptical, until we saw it in-person at our local gym equipment store. 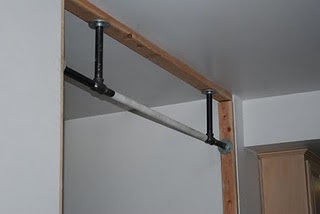 This will be our next purchase, so that we can do pull-ups at the same time. You can also use big rocks, tree stumps, or other sturdy things you've got lying around. Click here for a how-to guide for building your own. I hope that this is useful for those of you looking to jumpstart an at-home workout routine. I think that this will get you started, for $200-300 (depending on weights and quantities). This is a feasible option and will provide you with a number of options to help keep your workouts varied and fun. Though I think this is a great option for anyone within a limited budget, living in a rural area, or trying to find the extra time to fit in workouts, I can't say enough about finding a community to help motivate your workouts. CrossFit has changed the way that I look and feel, and has completely changed my view of fitness. I can't say enough about lifting heavy things (to increase strength), varying my workouts (in order to make fitness more fun), and having a workout partner (my husband) who pushes me to work harder, lift more, and test my limits. Find someone who will do this for you (and please be sure to return the favor) and you will get more out of your workouts, you will think twice before you quit, and you will work together to become better, stronger, faster, and more healthy versions of yourself. And, if you have a CrossFit or other local gym that will provide coaching and training (both physically and nutritionally), which incorporates a strength component (unless you are 'roiding up or eating to gain weight, you are not going to get huge lifting heavy weights...trust me! ), and which provides a community of people who push and encourage you to excel, check it out...it just may be what you've been looking for. Happy 2011 to you and here's to being healthy in the new year! Really like your blog. Keep up the good work. Our stories sound very similar. Crossfit and Paleo have changed my life let along my body. Keep up the good work and I'll be following your blog. Thank you, Craig! I appreciate your feedback and encouragement. Great list and as always super informative! There are a lot of times when my work schedule doesn't let me get to the box and I'm left to fend for myself at home or the park down the street. I was gifted a set of PowerBlock adjustable dumbbells by a friend and they've been a huge asset when I've needed to do WODs at home (his laziness has been my gain). I would also say resistance bands would be a good addition for mobility or for an extra challenge with situps. You can sets online for under $20. Yes! I forgot about that one. I'll add it to the list. I'm thinking like Kelly Starrett recommends, or like you would use to do band-assisted pull ups...is that what you're talking about? Yea, the bands like for pull-ups. I use one almost every morning to get the morning after workout stiffness out. Adjustable kettlebells? That does sound a little terrifying. On the plus side, I guess you would take less breaks if you knew a piece could fall out and knock you on the head at any minute. That workout was awesome! It looked like fun too...not boring like a lot of workouts can be. I just went Paleo three weeks ago, and I'm loving it! I will be ramping up my workouts soon to hopefully something similar to yours. Ashley~ That WAS a fun workout! Sometimes it's just fun to mix it up a little, you know? I love them! They're super lightweight and flexible, so you can move really easily in them. They make a huge difference in my lifts, as I just feel more solid and grounded.